"Georg Agricola" redirects here. For the German physician and botanist, see Georg Andreas Agricola. 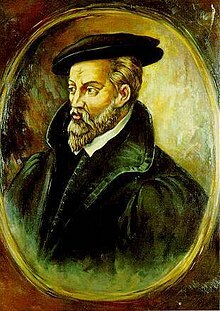 Georgius Agricola (/əˈɡrɪkələ/; 24 March 1494 – 21 November 1555) was a universally educated German Humanist scholar and one of the leading experts on mineralogy and metallurgy of his time, born in the small town of Glauchau, in the Electorate of Saxony of the Holy Roman Empire. He is well known for his pioneering work De re metallica libri XII, that was published in 1556, one year after his death. This 12-volume work is a comprehensive and systematic study, classification and methodical guide on all available factual and practical aspects, that are of concern for mining, the mining sciences and metallurgy, investigated and researched in its natural environment by means of direct observation. Unrivalled in its complexity and accuracy, it served as the standard reference work for two centuries. Agricola stated in the preface, that he will exclude all those things which I have not myself seen, or have not read or heard of.[... ].That which I have neither seen, nor carefully considered after reading or hearing of, I have not written about. He thereby refuses to rely on abstruse methods through philosophical considerations and instead submits his work to the strict principles of the modern scientific method, centuries before its time. As a scholar of the Renaissance he was committed to a universal approach towards learning and research and published over 40 complete scholarly works during his professional life on a wide range of subjects and disciplines, such as pedagogy, medicine, metrology, mercantilism, pharmacy, philosophy, geology, history and many more. His innovative and comprehensive scholarly work, based on new and precise methods of production and control is remarkable and has earned him international admiration to this day. He is often, although not universally referred to as "the Father of mineralogy" and the founder of geology as a scientific discipline. Poet Georg Fabricius has bestowed a brief honorary title on him in recognition of his legacy, that his fellow Saxons cite regularly: die ausgezeichnete Zierde des Vaterlandes, (literally: the distinguished ornament of the Fatherland). He was baptized with his birth name Georg Pawer. Pawer is a vernacular form of the modern German term Bauer, which translates to farmer in English. His teacher, the Leipzig professor Petrus Mosellanus convinced him to consider the common practice of name latinisation, particularly popular among Renaissance scholars, so "Georg Pawer" became "Georgius Agricola". Agricola was born in 1494 as Georg Pawer, the second of seven children of a clothier and dyer in Glauchau. At the age of twelve he enrolled in the Latin school in Chemnitz or Zwickau. From 1514 to 1518 he studied at the Leipzig University where, under the name Georgius Pawer de Glauchaw, he first inscribed to the summer semester for theology, philosophy and philology under rector Nikolaus Apel and for ancient languages, Greek and Latin in particular, He received his first Latin lectures under Petrus Mosellanus, a celebrated humanist of the time and adherent of Erasmus of Rotterdam. Gifted with a precocious intellect and his freshly acquired title of Baccalaureus artium, Agricola early threw himself into the pursuit of the "new learning", with such effect that at the age of 24 he was appointed Rector extraordinarius of Ancient Greek at the 1519 established Zwickau Greek school, which was soon to be united with the Great School of Zwickau (Zwickauer Ratsschule). In 1520 he published his first book, a Latin grammar manual with practical and methodical hints for teachers. In 1522 he ended his appointment to again study at Leipzig for another year, where, as rector, he was supported by his former tutor and professor of classics, Peter Mosellanus, with whom he had always been in correspondence. He also subscribed to the studies of medicine, physics, and chemistry. In 1523 he traveled to Italy and enrolled in the University of Bologna and probably Padua and completed his studies in medicine. It remains unclear where he acquired his diploma. In 1524 he joined the Aldine Press, a prestigious printing office in Venice that was established by Aldus Manutius, who had died in 1515. Manutius had established and maintained contacts and the friendship in a network among the many scholars, including the most celebrated, from all over Europe, whom he had encouraged to come to Venice and take care of the redaction of the numerous publications of the classics of antiquity. At the time of Agricola's visit, the business was run by Andrea Torresani and his daughter Maria. Agricola participated in the edition of a work in several volumes on Galen until 1526. In 1531 Agricola received an offer of the city of Kepmnicz (Chemnitz) for the position of Stadtleybarzt (town physician), which he accepted and he relocated to Chemnitz in 1533. Although little is known about his work as physician, Agricola enters his most productive years and soon becomes Chemnitz lord major and serves as diplomat and historiograph for Duke George, who was looking to uncover possible territorial claims and commissioned Agricola with a large historical work, the Dominatores Saxonici a prima origine ad hanc aetatem (Lords of Saxony from the beginning to the present time), which took 20 years to accomplish and was only published in 1555 at Freiberg. In his work De Mensuris et ponderibus , published in 1533, he describes the systems of Greek and Roman measures and weights. In the 16th century Holy Roman Empire there were no uniform dimensions, measures, and weights, which impeded trade and commerce. This work laid the foundation for Agricola's reputation as a humanist scholar, as he committed himself to the introduction of standardized weights and measures he enters the public stage and occupies a political position. In 1544, he published the De ortu et causis subterraneorum (On Subterranean Origins and Causes), in which he criticized older theories and laid out the foundations of modern physical geology, It discusses the effect of wind and water as powerful geological forces, the origin and distribution of ground water and mineralizing juices, the origin of subterranean heat, the origin of ore channels, and the principal divisions of the mineral kingdom. However, he maintained that a certain 'materia pinguis' or 'fatty matter,' set into fermentation by heat, gave birth to fossil organic shapes, as opposed to fossil shells having belonged to living animals. In 1546, he published the four volumes of De natura eorum quae effluunt e terra (The nature of the things that flow out of the earth's interior). It deals with the properties of water, its effects, taste, smell, temperature etc. and air under the earth, which, as Agricola reasoned, is responsible for earthquakes and volcanoes. The ten books of De veteribus et novis metallis, more commonly known as De Natura Fossilium are published in 1546 as a comprehensive textbook and account of the discovery and occurrence of minerals, ores, metals, gemstones, earths and igneous rocks, followed by De animantibus subterraneis in 1548 and a number of smaller works on the metals during the following two years. Agricola served as Burgomaster (lord major) of Chemnitz in 1546, 1547, 1551 and 1553. 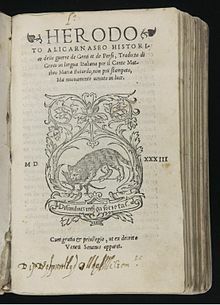 Agricola's most famous work, the De re metallica libri xii was published the year after his death, in 1556; it was perhaps finished in 1550, since the dedication to the elector and his brother is dated to that year. The delay is thought to be due to the book's many woodcuts. The work is a systematic, illustrated treatise on mining and extractive metallurgy. It shows processes to extract ores from the ground, and metals from ore.
Until that time, Pliny the Elder's work Historia Naturalis was the main source of information on metals and mining techniques. Agricola acknowledged his debt to ancient authors, such as Pliny and Theophrastus, and made numerous references to Roman works. In geology, Agricola described and illustrated how ore veins occur in and on the ground. He described prospecting for ore veins and surveying in detail, as well as washing the ores to collect the heavier valuable minerals, such as gold and tin. 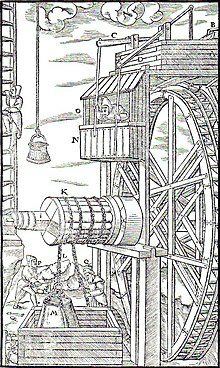 The work shows water mills used in mining, such as the machine for lifting men and material into and out of a mine shaft. Water mills found application especially in crushing ores to release the fine particles of gold and other heavy minerals, as well as working giant bellows to force air into the confined spaces of underground workings. Agricola described mining methods which are now obsolete, such as fire-setting, which involved building fires against hard rock faces. The hot rock was quenched with water, and the thermal shock weakened it enough for easy removal. It was a dangerous method when used underground, and was made redundant by explosives. The work contains, in an appendix, the German equivalents for the technical terms used in the Latin text. Modern words that derive from the work include fluorspar (from which was later named fluorine) and bismuth. In another example, believing the black rock of the Schloßberg at Stolpen to be the same as Pliny the Elder's basalt, Agricola applied this name to it, and thus originated a petrological term. In 1912, the Mining Magazine (London) published an English translation of De re metallica. The translation was made by Herbert Hoover, the American mining engineer and his wife Lou Henry Hoover. Hoover was later President of the United States. Agricola died on November 21, 1555. His "life-long friend," the Protestant poet and classicist Georg Fabricius, wrote in a letter to the Protestant theologian Phillip Melanchthon, "He who since the days of childhood had enjoyed robust health was carried off by a four-days' fever." Agricola was a fervent Catholic, who, according to Fabricius, "despised our Churches" and "would not tolerate with patience that anyone should discuss ecclesiastical matters with him". That did not stop Fabricius in the same letter from calling Agricola "that distinguished ornament of our Fatherland," whose "religious views...were compatible with reason, it is true, and were dazzling," though not "compatible with truth"; in 1551 Fabricius had already written the introductory poem to De re metallica in praise of Agricola. According to traditional urban customs, as a former lord mayor he was entitled to a burial in the local mother church. His religious affiliation, however, outweighed his secular prerogatives and monumental services for the city. Chemnitz Protestant superintendent Tettelbach urged Prince August to command the refusal of a burial inside the city. The command was issued and Tettelbach immediately informed the Agricola party. ^ a b "Georgius Agricola". University of California - Museum of Paleontology. Retrieved April 4, 2019. ^ a b c d "Georgius Agricola (1494 - 1555)". Agricola-Forschungszentrum Chemnitz. Retrieved April 4, 2019. ^ a b Wilhelm Pieper. "Agricola, Georgius (Georg Bauer), wahrscheinlich in Zwickau". Deutsche Biographie. Retrieved April 5, 2019. ^ a b Reinhold Hofmann,. "Dr. Georg Agricola : ein Gelehrtenleben aus dem Zeitalter der Reformation - p. 9". Archive org. Retrieved April 5, 2019. ^ a b "Neue deutsche Biographie, Bd. : 1, Agricola, Georgius". Münchener Digitalisierungszentrum. Retrieved April 4, 2019. ^ "Geschichte der Westsächsischen Hochschule Zwickau - Georgius Agricola lehrte von 1519 - 1522 in Zwickau". Westsächsische Hochschule Zwickau. Retrieved April 4, 2019. ^ "Denkmal Georgius Agricola". Glauchau de. Retrieved April 5, 2019. ^ Cyril Stanley Smith, Martha Teach Gnudi. "The Pirotechnica of Vannoccio Biringuccio - Translated from the Italian with an introduction and notes by Cyril Stanley Smith and Martha Teach Gnudi, p. 45" (PDF). The American Institute of Mining and Metallurgical Engineers. Retrieved April 4, 2019. ^ "Der Mann, der aufschrieb, wie das Silber aus dem Berg kommt". DIE ZEIT Archiv. March 18, 1994. Retrieved April 5, 2019. ^ Georgius Agricola, De re metallica, translated from the first Latin edition of 1556, Herbert Clark Hoover and Lou Henry Hoover, tr., New York: Dover Publications, 1950, (reprint of the London: Mining Magazine edition of 1912), p. viii of the introduction. ^ Raphael S. Bloch, M.D. (31 May 2012). Healers and Achievers: Physicians Who Excelled in Other Fields and the Times in Which They Lived. Xlibris Corporation. pp. 125–. ISBN 978-1-4691-9248-2. ^ Friedrich Naumann (9 March 2013). Georgius Agricola, 500 Jahre: Wissenschaftliche Konferenz vom 25. – 27. März 1994 in Chemnitz, Freistaat Sachsen. Springer-Verlag. pp. 27–. ISBN 978-3-0348-7159-4. ^ Sir Charles Lyell (1832). Principles of Geology: Being an Attempt to Explain the Former Changes of the Earth's Surface, by Reference to Causes Now in Operation. J. Murray. ^ Annette Bouheiry. "DIE EISENBIBLIOTHEK UND IHRE AGRICOLA-BESTÄNDE". archives. Retrieved April 12, 2019. ^ Thomas Thomson (1830). The History of Chemistry (Complete). Library of Alexandria. pp. 197–. ISBN 978-1-4656-0789-8. ^ Georgius Agricola (2004). D Natura Fossilium (Textbook of Mineralogy). Courier Corporation. pp. 1–. ISBN 978-0-486-49591-0. ^ a b H. Hoover, L.H. Hoover. "De Re Metallica – Agricola, Hoover, pp. xi-xii, xvi, xxi-xxiv". Farlang. Retrieved April 5, 2019. ^ Georgius Agricola. Springer-Verlag. 13 August 2013. pp. 123–. ISBN 978-3-322-95384-1. ^ Die Reformation ihre innere Entwicklung und ihre Wirkungen im Umfange deLuterischen Bekenntnisses von J. Döllinger. J. Manz. 1848. pp. 583–. ^ Gisela-Ruth Engwald. "Zum 450. Todestag von GEORGIUS AGRICOLA" (PDF). TU Chemnitz. Retrieved April 5, 2019. Carolyn Merchant (1980). The Death of Nature: Women, Ecology and the Scientific Revolution (San Francisco: HarperCollins). Ralf Kern (2010). Wissenschaftliche Instrumente in ihrer Zeit. Vol. 1. pp. 334–336 (Cologne: Koenig). Wikimedia Commons has media related to Georg Agricola. Herbermann, Charles, ed. (1907). "George Agricola" . Catholic Encyclopedia. 1. New York: Robert Appleton Company.